Seal keeping a close eye on nearby pup. Bay , near strumble head, (Porthsychan) . 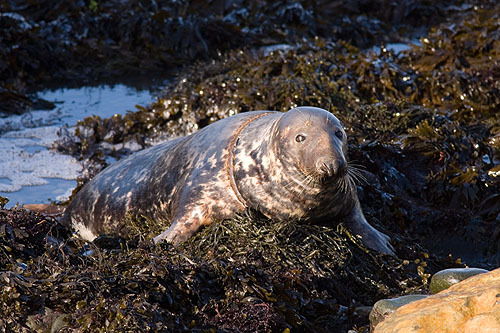 Seal Pups on beaches , Sept-Oct-Nov.
Grey Seals are the largest breeding seals found in the UK. Half of the world's population of grey seals is found around British coasts / In the autumn, females congregate at traditional pupping sites called rookeries / Pups weigh 14 kilograms at birth / When feeding seals can dive to a depth of 70 metres / Pembrokeshire has a 5,000 strong colony / Pups are born in caves or on beaches from Mid August -October / The white-coated pups spend the first three weeks feeding / Mothers feed the pups three to four times a day (the pups are left alone the rest of the time) / After this the pups are left to fend for themselves, spending most of their time at sea, returning to the shore to haul out and rest / Grey seals are a gregarious species, living and feeding in groups. Their coats are dappled silvery to dusky brown-grey in colour / Male Grey seals appear to be black when wet / Males are bulky animals that can grow up to 2.5 metres in length, and weigh up to 330 kg / females are smaller than the males - 2m in length , and weigh up to 180kg / Lifespan 30-40 years . After the breeding season seals congregate on beaches , from December to February or March , to go through their annual moult.